The crew “from over the hill” filmed a thrilling sea chase against the colorful background of Prohibition Princeton–a small jumble of isolated roadhouses and fishing shacks. Whenever possible, Peninsula Studios–an indie motion picture company located far north from Hollywood in San Mateo–liked to shoot on location rather than on a contrived stage with paper waves. The studio often took advantage of Northern California’s pictorial charm and the tapestry of its natural settings: the mountains, timber forests, rugged coastline could stand in for any romantic place in the world. Beth Wylie, our heroine, is a young mother surviving on a shoestring budget. Presuming that her missing husband, the bad guy, is dead, she falls in love with Tom Benham, the friendly life insurance agent. Suddenly Beth’s hubby turns up–and she is horrified to learn that he has been smuggling Chinese families into California on a schooner. 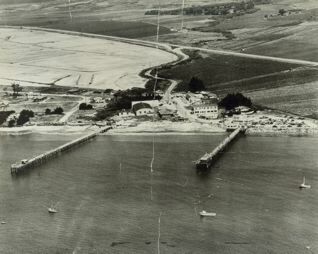 To prevent his wife from running off with Tom, the bad guy husband kidnaps her and sets sail at Pillar Point Harbor near the fishing village of Princeton. Madly in love, Tom pursues his beloved Beth in a tug boat. During an exhilirating sea battle-chase on the high seas, Beth’s husband is killed. “Let Women Alone” ends happily as Tom and Beth are married.